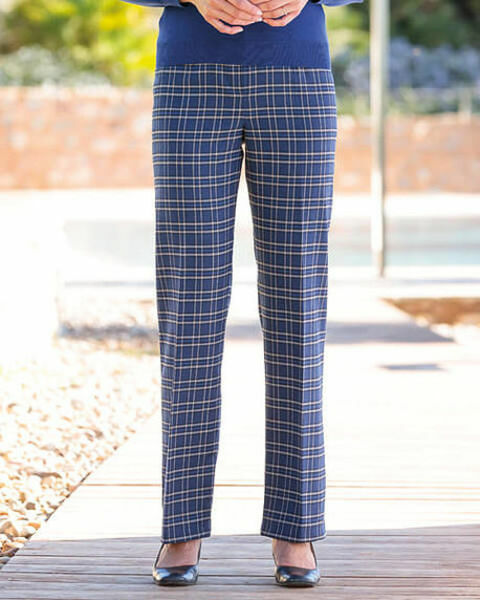 Ladies wool blend trousers. Machine wash. Sizes 10-24. Length 28",30"
Flat front style with front zip and button fastening. Side back waist elastication for added comfort with side seam pockets and belt loops. Distinctive check in sapphire with highlights of camel and cobalt. Soft, easycare wool blend fabric. 52% wool/46% polyester/2% lycra. A great, sophisticated trouser. Available in 2 lengths 28", 30". Please add your specific alterations to the box below. "Very impressed with the speed of delivery of my order and very pleased ..."